(1) Watson, James D., Tania A. Baker, Stephen P. Bell, Alexander Gann, Michael Levine, and Richard Losick. Molecular Biology of the Gene.Glenview, IL. Pearson, Cold Spring Harbor Laboratory P. 2014. Print. (2) Shen, Ning, et al. "Structure of human tryptophanyl-tRNA synthetase in complex with tRNATrp reveals the molecular basis of tRNA recognition and specificity ." Nucleic Acids Research 34.11 (2006): 3246-3258. (3) Tryptophan Chemical Structure. N.d. Amino Acid Structures. About Education. By Todd Helmenstine. Web. 07 Dec. 2015. (4) Phil. "Topology in 2D and 3D- The Rossmann Fold." Web log post. Protein Portraits. OSU Honors College, 16 Apr. 2012. Web. 3 Dec. 2015. (5) Ibba, Michael, and Dieter Söll. 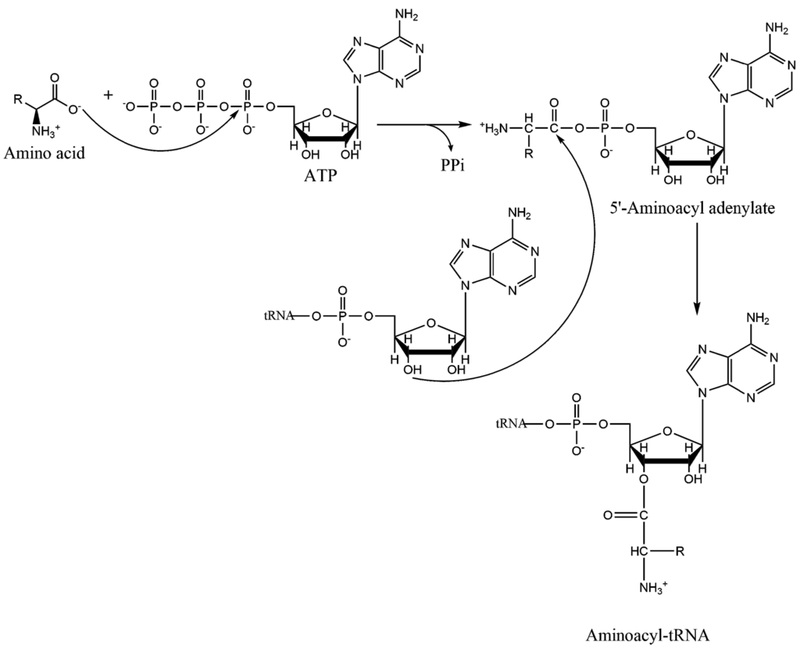 "Aminoacyl-tRNA synthesis." Annual Review of Biochemistry 69.1 (2000): 617-650. (6) Li, Rongzhong, et al. "Md simulations of tRNA and aminoacyl-tRNA synthetases: Dynamics, folding, binding, and allostery." International journal of molecular sciences 16.7 (2015): 15872-15902.